Bangalore has always been right up there with Wraith and Lifeline at the top of most players’ Apex legends character tier lists. She’s highly mobile, easy to learn, difficult to deal with, and comes equipped with a variety of versatile tools to help her team gain the upper hand in a majority of confrontations. Our Apex Legends Bangalore guide is here to show the ropes to players just starting out with this powerful character, as well as providing some more advanced tips and useful information that will benefit even seasoned Bangalorians. Despite her nerf at the beginning of Season 1, Bangalore is one of the strongest characters on offer at the moment in Apex Legends, and it’s not hard to see why once you have a clear grasp of everything she can do in skilled hands. Click on any of the links below to quickly skip ahead to a particular section and start learning. Bangalore is a solid addition to any team in Apex Legends. Her Passive ability gives her increased mobility and makes her even harder to ping down than she already is; and her Tactical and Ultimate abilities provide excellent crowd control and synergise well with various abilities available to other characters. Not only is she an excellent (some might even say essential) team player, but she is a formidable force even while playing solo. Her Smoke Launcher gives her an effective method of escape when the odds are stacked against her, which, combined with her Passive movement speed buff, makes her a challenge to take down even when outnumbered. Her only downsides are in misuse (or lack of use) of her abilities. Bangalore’s Tactical should be used as frequently and aggressively as possible, so if you are not doing this then you should start getting into the habit of it immediately; and her Ultimate, while useful in certain situations, has the drawback of concussing your teammates and concussing and damaging yourself too. With the arrival of the Season 1 update for Apex Legends, Bangalore received a slight nerf to her ability set. Specifically, she received a reduction to the speed bonus granted by her Passive when taking enemy fire, which brought her increased speed from 140% down to 130%. This is still an excellent ability, however, which gives her the same speed as the new character Octane. For full details on all recent Legend and ability changes, check out our Apex Legends update guide. 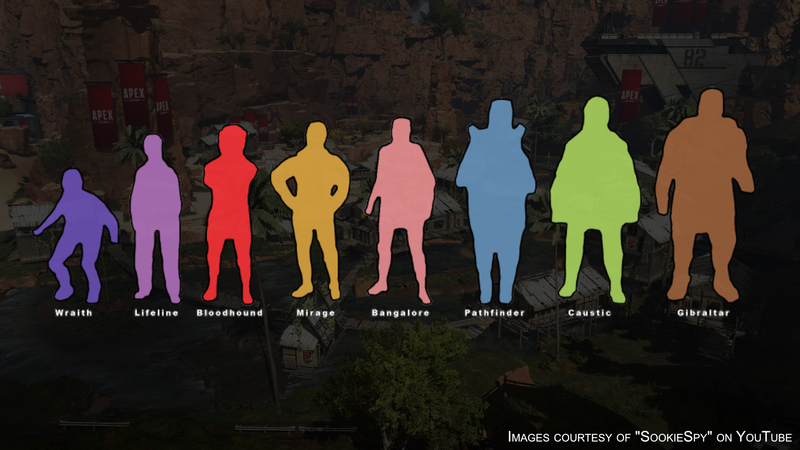 Bangalore sits in a very average position, but you’ll notice that while there is a sizeable increase in the hitbox size from Bangalore to Pathfinder, the hitboxes of Bloodhound, Mirage, and Bangalore are all similar enough that you could be forgiven for saying that Bangalore in fact has the joint-third-smallest hitbox in Apex Legends. Regardless, her Passive and Tactical abilities combine with her diminutive frame to make her one of the hardest-to-hit Legends in the game. Bangalore’s abilities are some of the most versatile abilities in Apex Legends – and if you’ve just started playing as her, then you should throw away any preconceptions you might have about her Tactical being used purely as an escape tool, or her Ultimate acting as a “kill enemy team” button. Let’s break down each of her abilities in turn and explain when and how you should use them to get the most out of each. Double Time 30% Taking fire while sprinting makes you move faster for a brief time. Bangalore’s Passive, I think we can all agree (and if you don’t, prepare to be schooled), is the most reliably useful Passive ability of any character. A flat 30% speed boost when you are hit or when shots are fired nearby is tremendously powerful both for escaping danger and repositioning for a flank attack. It may only last 2 seconds each time, but that’s more than long enough to get you in or out of danger, and it has a very low cooldown, meaning you can benefit from this Passive several times in a single fight. with this ability, you can feel even safer while making aggressive plays, either to close the gap between you and an enemy or to go on a wide flank attack while your teammates push forward from your current position. As with Bloodhound‘s Ultimate or Octane‘s Tactical, you can use Bangalore’s Passive to strafe, or “A/D spam”, extremely quickly, making you much harder to hit until the speed buff wears off. You don’t have to be hit in order for Bangalore’s Passive to activate. Shots passing close by will also activate the ability. So keep moving! Use Bangalore’s Passive both defensively and aggressively. A movement speed boost is excellent in all situations in Apex Legends. You can take advantage of its reactionary nature by moving out into the open and baiting some fire from the enemy, just so your Passive procs and you gain the speed buff to help you with repositioning or pushing. Smoke Launcher 15s 2 33s per charge Fire a high-velocity smoke canister that explodes into a smoke wall on impact. Just as useful a method of escape as Wraith’s Tactical ability (though both have different strengths and weaknesses), Bangalore’s Smoke Launcher is the true reason for her dominance and popularity in the current Apex Legends meta. The first thing to realise is that you have two charges with your Smoke Launcher – you can see next to your Tactical ability icon that there are two bars which indicate your current number of charges. Each of these charges are expended and refilled independently, and with each use, you fire a grenade that explodes on impact into a large screen of smoke, which you cannot see through unless you are Bloodhound or you have a Digital Threat sight (for more info on this take a look at our Apex Legends attachments guide. The true power of Bangalore’s Smokes, however, are in their use for aggressive plays, and if you are only using her Tactical defensively to reposition or revive a teammate, you’re not utilising it to its fullest capabilities. With a couple of Smokes directed at or near the enemy, you can zone out areas, control the pace of the encounter, or downright disorientate them and give your team a distinct advantage. Each Smoke wall lasts for 15 seconds before dissipating. Digital Threat sights are an essential part of Bangalore’s kit as they allow you to see through your own Smoke, so if a teammate finds one they should prioritise giving it to you. Similarly, you can combine Bangalore’s Tactical with Bloodhound’s Ultimate to create a really bad day for the enemy team. Smoke explosions deal 10 damage if they hit an enemy. It’s often better to stick to the very edges of your Smoke rather than diving right in. You can look into the Smoke without your vision being entirely obscured, and you can escape easily into the Smoke if threatened. Rolling Thunder 40 per missile 4m 30s Call in an artillery strike that slowly creeps across the landscape. Bangalore’s Ultimate ability sounds like some sort of massively destructive nuke ability that eviscerates anything caught in the target area, but if that’s what you’re after with this ability then you’ll end up disappointed. Think of Rolling Thunder not as a “kill team” button but as a “create massive blockade” button, and you’ll start to see the true benefits of her Ultimate. In much the same way as her Smokes, Bangalore can use Rolling Thunder for zoning purposes. If you place it on an enemy team, it won’t take them too much effort to escape it; but if you place it between yourself and the enemy, then it gives you increased opportunity and safety for repositioning or retreating. When faced with an aggressive enemy team, you can even fire it directly on yourself – though be aware that the missiles will hurt and concuss you, and they can concuss your teammates as well. Prioritise using Bangalore’s Ultimate for defensive rather than offensive purposes. It is best used to retreat or reposition, or to slow the approach of an enemy team (particularly a third party). Don’t ult your teammates without letting them know what you’re doing. The concussion effect is nasty, and to avoid broken friendships make sure you communicate your intentions. If you want to use your ult offensively (to flush out an enemy team while pushing) then use it at the very beginning of the fight, because otherwise the missiles will land too late to be effective. Finally, let’s finish up with some more general tips and tricks on winning Apex Legends matches as Bangalore. Aggression is key. Bangalore’s Passive and Tactical both give you an out if things go south, so you have even more reason than most to make the aggressive pushing plays that will finish off a fight quickly. Equip Bangalore with a Shotgun or SMG. To this end, it’s best to equip her with an R-99, a Peacekeeper, or some other weapon that can quickly eliminate enemies at close range. The whole idea with Bangalore is to get up close and personal as quickly as possible. Use Smokes as often as possible. Bangalore’s Smokes are quite possibly the most versatile ability in the entirety of Apex Legends. Use them while looting death boxes. Use them while reviving. Use them while attacking. Use them while defending. Use them for practice. Just use them. Communicate your intentions with your team. As Bangalore, you have the potential to completely change the pacing and makeup of an encounter with your Tactical and Ultimate abilities. But both abilities can also hurt your teammates, so make sure you communicate your intentions and actions with them, particularly during fights. That’s everything we’ve got on how to master Bangalore. The main takeaways are to use you Smokes offensively, and your Ultimate defensively (counterintuitive, I know, but just trust me). Now get out there and start sowing chaos and confusion among the ranks of your foes.